Spring is a time of new beginnings, so why not start on a clean slate with your RV? 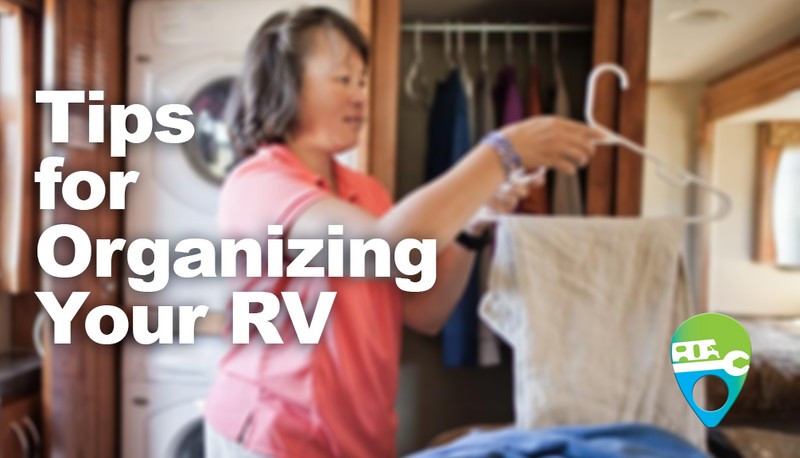 A great way to begin your RV season is to clean and organize! We know that living in less than 500 square feet can get stressful and cluttered fast, which is why being proactive in your organizing can make a world of difference. This blog will give you some helpful tips and inspiration on how to live an organized life in your home-on-wheels! The first and most important step is to go through all of your belongings and determine their importance. There is no room in the RV lifestyle for large amounts of things that don’t have a purpose or function. Items that are not needed in the current season, such as winter clothes, can be stored in vacuum bags and put in the far back of your closet or other storage area. A key to successful organization is to strategically store all items, placing regularly used belongings in easier to reach areas, and infrequently needed ones further back. Once you have gone through your entire RV, ridding yourself of unneeded items, the next step is to prepare for some fun shopping! 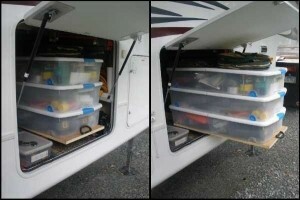 Look at every area of your RV as an opportunity for storage. 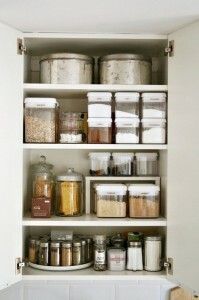 The inside of pantry doors, cabinets, underneath sinks, are all places you can make great use of with a strategic plan. Identify which areas need organization products and take measurements of those spaces for items such as storage bins, shoe organizers, shelving units and so on. What Storage Items Do You Need? 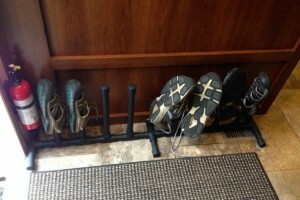 Command hooks can be used all over your coach, perfect for hanging all types of items. 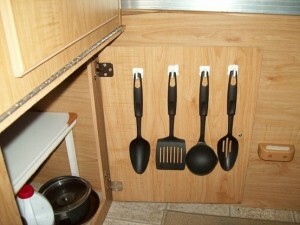 Cooking utensils in the kitchen, toiletries in the restroom, and clothing in your closet are examples of the many ways Command hooks can be used to maximize space and function in your RV. You will want to utilize all available space in your RV’s closets, pantries, and storage areas, so it’s important to pack them with fitting storage bins and other organizing tools. Purchase an array of storage containers in response to what items you need organizing. 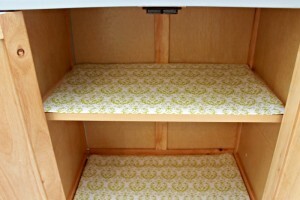 Have large items, such as cleaning products that need organizing? Get a large bin or two. Have tons of tiny belongings like safety pins or nails? Get a few small containers to keep those items separated. Dirty shoes come with the territory when camping, so it’s important for them to have a designated spot upon entering the RV! Great product examples include the IKEA Trones cabinet, a ground level shoe rack, or you can get creative and re-purpose a hook rack. 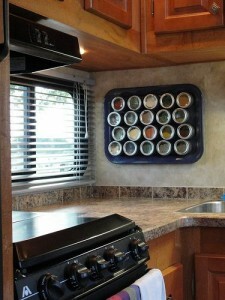 There is a lot of usable space in your RV’s pantry, so don’t let it go to waste! Storing your food in complimenting containers will keep everything even and organized, using all available space and keeping your food fresh! Go through your rig and find which spots are magnetic. Items such as spices or utensils work greatly in these situations, just make sure the magnets are heavy duty to prevent falling items. 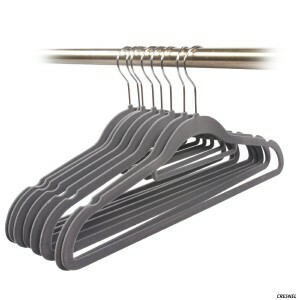 You only have so much room to work with in your closet, which is why ultra-thin hangers are extremely helpful. The thinner the hanger, the more you can fit into your closet, giving you the opportunity to keep your wardrobe selection large or to use the available space for another storage item. 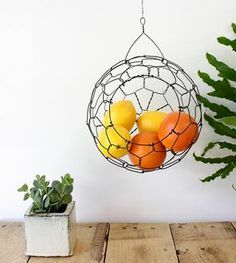 Hanging baskets can work perfectly in your kitchen for fruit. They can also work in the bedroom for dirty laundry and in the bathroom for toiletries or linens. Life on wheels means that your belongings are bound to move around, which is why investing in a good amount of shelf liner is key. It’s both affordable and useful, and can be used almost anywhere in your RV. We hope these examples of RV organization have inspired you to make some changes in your home on wheels! Have any products to recommend to fellow RVers or have a renovation tip to share? Leave a comment below! Thanks for the tips, we are heading out in 6 days, we are all very excited. Where did you get the metal tray for the magnetic spice containers? I can't find one. We are planning a two or three month truck camper trip, accompanied by two miniature schnauzers and a humongous Border Collie. Other than a mental health check and tranquilizers, any suggestions for travelling with dogs in an extended cab truck and camper? I will certainly appreciate any advice and/or ideas. Great ideas! Nice article. My husband and I spend two months or more at a time in a tiny camper with our two dogs. I know what you mean about organization! I've done a lot of mods that it made my camper more comfortable and all the space useful. Let me know what you think! https://WackyPup.Blogspot.com The idea you have abount underbed boxes for the outside storages area is great. Thanks! I am blessed to have a fifth wheel that was extremely well designed for full time living. But there is always room for improvement. The large cupboard above the pantry was always cluttered, so I put in two expandable curtain rods about a foot apart and 10 inches from the top and that holds paper towel rolls and a large tray up and out of the way. Would post a pic if I could.